Updike remains both a critical and popular success; however, because Updike asked that his personal letters not be published the only way that Updike scholars and fans can read more of the author’s candid and insightful remarks is to revisit some of the many interviews he granted—most of which are difficult to locate or obtain. Updike wrote about his home town of Reading in Berks County, Pennsylvania for much of his adult life, setting most of his early fiction and all of his award-winning novels in his home state. In John Updike’s Pennsylvania Interviews, James Plath has compiled the first collection of interviews that illustrates and helps to explain the bond between one of America’s greatest literary talents and his beloved Pennsylvania. Included in this volume are interviews and articles by Mark Abrams, Leonard W. Boasberg, Carl W. Brown, Jr., David Cheshire, Marty Crisp, Sean Diviny, John Mark Eberhart, William Ecenbarger, Elizabeth Greenwood, Ruth Heimbuecher, Dorothy Lehman Hoerr, Jim Homan, Tom Knapp, Karen L. Miller, Steve Neal, Richard E. Nicholls, Sanford Pinsker, James Plath, Bruce Posten, Carole Reber, Pamela Rohland, Carlin Romano, Daniel Rubin, Stephan Salisbury, Charles R. Shaw, Ellen Sulkis, Heather Thomas, Stanley J. Watkins, Michael L. Wentzel, and Robert F. Zissa. James Plath is one of the premier authorities on John Updike's work and days. Professor Plath's earlier book, Conversations with John Updike, is the most quoted book in Updike studies. 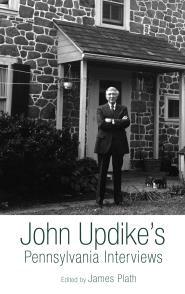 I have no doubt that Native Son: John Updike's Pennsylvania Interviews will be equally invaluable to our understanding of the great and complex writer. Once again, Jim Plath delivers a deeply engaging and important collection of Updike interviews. Stitching together 44 profiles and interviews conducted by a range of figures–Terry Gross, local journalists from the Reading Eagle, a high school student–Plath, who adds his own introductory and concluding observations, proves a knowledgeable and emotionally invested guide. Native Son will appeal not only to general readers, academics, and students, but to those interested in listening to a writer who could string together sentences as beautifully as any figure from American literature. In taking its author back to the state he left in 1950, Native Son is a homecoming story that casts a spell and radiates with Updike’s life-long affection for Pennsylvania. Plath has been a major player in Updike studies, and his latest effort should be required reading for those wishing to know more about the wunderkind from Shillington. James Plath has given Updike enthusiasts an indispensable record of Updike’s remarks to Pennsylvania interviewers. They reveal not just Updike’s renowned fluency but his inimitable charm and suave wit, making Native Son a sheer delight as well as a richly informative volume. Plath’s commentary provides a fine guide to his exploration by offering thematic links within the interviews. He proves that Updike was more open and revealing to Pennsylvania interviewers than those beyond his native state. John Updike claimed his ‘artistic eggs were hatched’ in Pennsylvania, which makes Native Son, James Plath’s collection of his Pennsylvania interviews, essential reading for understanding Updike. The state occupied a vital place for Updike across his star-studded career. Plath reveals this connection with interviews that span four decades, both adding to the scholarly record and providing readers with new insight into Updike’s enduring significance.